Caitlyn Jenner Attends Pride Event in NYC, Makes It Rain Cash: Watch Now! Call on Caitlyn! Caitlyn Jenner attended an NYC Pride event on Sunday, June 28, the same day as the annual Gay Pride Parade. The 65-year-old former Olympian visited the PH-D Rooftop Lounge in the Dream Downtown Hotel in Manhattan&apos;s Chelsea neighborhood. According to one onlooker, Jenner, wearing an all-white ensemble, arrived to a large crowd chanting "Caitlyn! Caitlyn! Caitlyn!" "Caitlyn was blushing and waving," the source tells Us Weekly. "She looked very touched. Caitlyn was laughing and chatting with everyone." Actress Candis Cayne, who also attended the event, dedicated the song "I Am a Woman" to Jenner as the crowd cheered. Later the reality star made it rain cash all over Cayne as the party guests danced on the tables. "Caitlyn was dancing with her friends and even flipping her hair," another onlooker dished to Us. The event was hosted by Steele Luxury Travel in collaboration with Jared Needle and Voss Productions, who shared snaps of Jenner via Instagram. 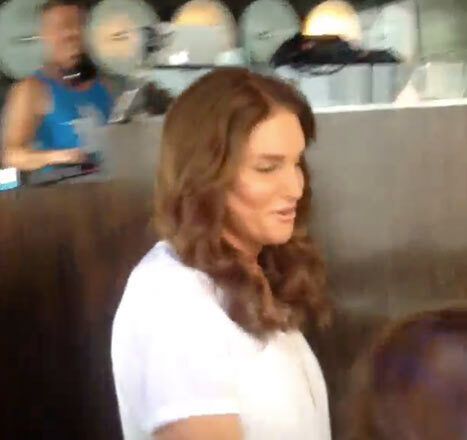 Steele Luxury Travel&apos;s Instagram page captured Jenner&apos;s rousing entrance in a video. "Hello #Caitlyn #CaitlynJenner #PRIDE #NYC #NewYork #Manhattan #Progress," the caption read.